Everywhere I look is the horrific aftermath of the incident that made me want to put new laws into place. The walls, the doors and even the windows showed the evidence of a crime of passion. Something had to be done to stop this senseless action. 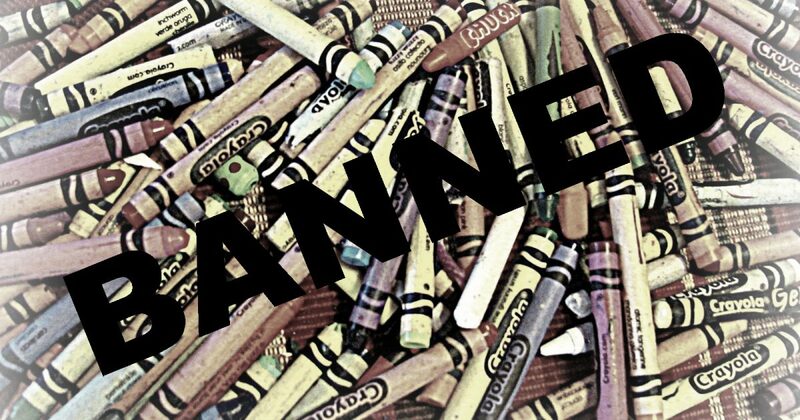 I move to make a law that high capacity crayon boxes be banned. After all, it is having access to these weapons of mass destruction that is the real problem. I certainly can’t blame the big brown eyes of the artistic cherub. I can’t blame the fact that supervision wasn’t top notch at the time of the crime. It seems to me like I should be able to trust the child to govern themselves since I had told them the rule before. The writing on the wall is telling me that the blame must fall on the manufacturing and distribution of these evil 64 count crayon boxes. My doodling offspring can’t be held responsible. I am sure she didn’t wake with the intention of creating preschool hieroglyphics on the wall. Sure, she has shown an interest in coloring before, but I really don’t think she meant harm or knew what she was doing. Had she not had access to such a vast array of hues and shades, it never would have happened. Her intention would have been only to color on paper if only one crayon had been made available. She may have pulled a bulk size toilet paper off the shelf and covered the house with Quilted Northern confetti and she may have opened a container of kool-aid powder and sprinkled the dogs and couch, but I only took my eyes off her for a moment. Maybe there were a few incidents that alerted me to her underlying need to decorate, but it all goes back to these high capacity crayon boxes. There is no way I can judge my child as guilty of such crimes of passion, regardless of her intention or past history. This falls onto the Genius that thought offering the big boxes of crayons would be a great idea. No person could possibly think that having access to that many crayons would be good. They must be taken off the shelf before they perpetuate further crimes. Somehow the law makers have failed us. I thought we were safe once the last box of 64 count crayons were pulled from the shelves. We should have been safe. The pint-sized Picasso got into my make-up bag and snagged my lipstick. She covered the door glass with Sizzling Sienna smiley faces. Then she got into one of the bigger kids backpacks and stole a pencil. Tiny graphite scribbles now adorn the top of my dining room table. She ended with a finale of broad strokes of a found piece of charcoal on my beige couch. We must storm the government with requests to begin amputation of hands at birth. If that doesn’t work then we should dis-arm them. The writing on the wall has shown me that children with hands cannot be trusted and therefore must lose those dimpled fists to prevent these terrible acts.